University of North Texas Press, 9781574412710, 152pp. 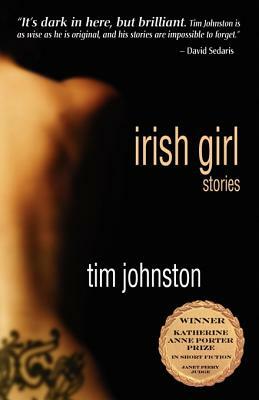 Inside Tim Johnston's Irish Girl (winner of the Katherine Anne Porter Prize in Short Fiction) readers will find spellbinding stories of loss, absence, and the devastating effects of chance—of what happens when the unthinkable bad luck of other people, of other towns, becomes our bad luck, our town. Taut, lucid, and engrossing, provocative and dark—and often darkly funny—these stories have much to offer the lover of literary fiction as well as the reader who just loves a great story. TIM JOHNSTON was born in Iowa City, Iowa. When his first novel, Never So Green, was published, he was working as a carpenter in Hollywood, California. His fiction has been included in the O. Henry Prize Stories and David Sedaris’ anthology of favorites, Children Playing Before a Statue of Hercules. Awarded a MacDowell Fellowship in 2008, Tim is currently back in Iowa City, writing a new novel.